Asset Backed Securities (ABS) are the preferred method for smaller banks and specialty finance companies to finance pools of familiar asset types, such as auto loans, credit card receivables, mortgages, and business loans. Revolution targets a 40% portfolio allocation to ABS. Despite weakening conditions in broader credit markets in 2018, demand for ABS investments remained strong as spreads drifted modestly wider over the course of the year. The combination of the Royal Commission and tighter regulations has significantly impacted the risk appetite and overall credit growth within the banking sector. Consequently, public issuance in the Australasian ABS market was down around 20% in 2018, but this has been offset by significant growth and activity in the private ABS warehouse space, driven by the non-bank originators. On this front, Revolution has signed non-disclosure agreements and commenced due diligence on three private ABS warehouses investments in Australia and New Zealand and the expectation is that opportunities will remain compelling in this sector going forward. Why is AU & NZ ABS an interesting opportunity for investors? In the non-public ABS market (warehouse transactions), there are very few players. This is a function of few investment managers having the skill, experience or the mandate to asses, internally rate and provide funding for private ABS warehouses. This creates an inefficient market thus creating a significant and attractive investment opportunity for Revolution given the experience, track record and long-standing relationships with sponsors in the ABS space. Revolution’s investment team utilises proprietary models consistent with external ratings agencies to internally credit rate all ABS transactions. The fact that there are very few players in the space in Australia and New Zealand adds further weight to the opportunity for compelling risk adjusted returns. The Fund targets well established non-bank originators of loans that have a demonstrated long track record in their chosen sub-sector of ABS. For an investment to pass due diligence, an ABS warehouse transaction requires significant alignment through ‘skin in the game’, typically provided via first loss equity from the originator in each transaction. As the non-bank sector is growing rapidly as a result of the banking royal commission, the investment team remains extremely cautious on newly established and rapidly growing originators and fintech companies, those of which may not have the required governance, infrastructure and access to capital and can potentially translate into greater risk when investing in warehouse funding vehicles. There is significant commentary around the bearish outlook for residential property in Australia, especially in the major cities of Sydney and Melbourne. In a recent report, Fitch Ratings notes that weaker housing market conditions and modest increases in interest rates could put some upward pressure on mortgage arrears, but not enough to cause a significant deterioration in RMBS or covered bond performance. They expect national house prices to drop by 5% in Australia in 2019, a similar pace to last year, taking the peak-to-trough decline to 12%. Considering this, Revolution is avoiding high loan-to-value pools with significant concentration to inner city apartments and loans that have a lower level of seasoning within the pool. What is important to note regarding the risks around RMBS, is that the Fitch Ratings report states that “the most expensive quartile of properties has experienced the largest declines with falls of 9.5 per cent nationwide”. Most of the underlying loans in RMBS are in the $400k to $500k total loan size, which is well below the threshold for the most expensive quartile. Additionally, there is a penalty applied in RMBS rating criteria for larger loan balances, which means they tend to be originated and funded on balance sheet by ADIs and never securitised in RMBS. The report also states that the price declines are likely to be sharper in Sydney and Melbourne, the cities where gains over the previous five years were strongest and affordability has become most strained. A mitigating factor to this risk in RMBS, is that Victoria and NSW have the lowest levels of unemployment in the country after the ACT, as shown in the table below. 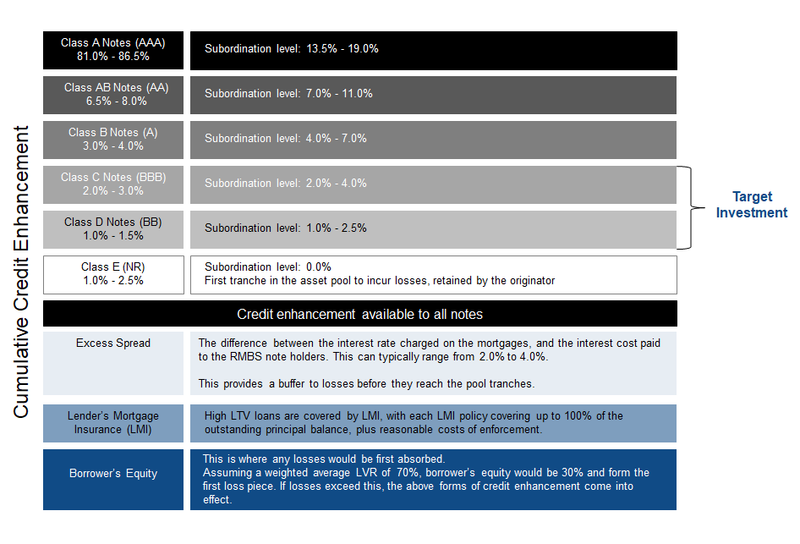 Whilst Revolution agrees with Fitch’s positive view on RMBS performance, the investment team remains cautious on RMBS and will continue to focus on the originator’s track record and the underlying structure and will favour other types of non-residential ABS such as credit cards, personal loans and equipment loans. This caution on RMBS will remain until the full effects of changing credit standards and wash up of the Banking Royal Commission are evident. These non-residential mortgage transactions are typically of shorter tenor with greater structural protections and credit enhancement. The very first investment the Fund made was an ABS transaction, with a second transaction due to follow in the near term. There is a strong pipeline of potential investments currently undergoing due diligence with well-established originators that have strong governance, track record and structures – an opportunity set that has the potential to offer investors compelling risk-adjusted returns.